As the winter finale of ABC’s “Nashville” draws closer, the plot lines grow thinner and the scant 10-song soundtrack follows suit. 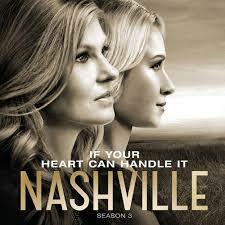 Domestic turmoil is the major theme this season as diva Juliette Barnes (Hayden Panettiere) becomes unexpectedly pregnant before the filming of a Patsy Cline biopic. Unfortunately, Panettiere’s excellent rendition of “Crazy” is omitted on the album. In a tumultuous love triangle, Charles “Chip” Esten (Deacon Claybourne) turns in a clichéd, yet pleasing acoustic ode, “I Know How To Love You Now “to the soon to be married Reyna James (Connie Britton) the woman he will always love. Despite some samples of heavy shredding in the episodes, the only scorcher here is “Gasoline and Matches.” It draws an immediate comparison to Miranda Lambert’s “Gunpowder and Lead.” Nearly half the album is comprised of duets and full ensemble numbers. As a result, the show’s standout female vocalist, Claire Bowen, is overshadowed. The premise of the show invites comparisons of the recurring traditional versus. contemporary country battle on the airwaves as the aging (very well) James struggles to stay relevant in the digital age. Most of her fictional hits from the past have textures that suggest she was once accompanied by banjo and fiddle in her heyday. In order to keep pace, her present day versions are performed in arenas and at large festivals with huge production budgets and glossy reinterpretations. With her youthful style and command of 20,000 seat arenas, it may be hard to view Britton as a dyed in the wool country singer. But even with no prior public singing experience she is certainly very convincing as a superstar. Esten performed his first ever headlining tour this past summer. According to “The Boot,” fellow cast mate Bowen will join him as an opening act for Alan Jackson and Jennifer Nettles in 2015. Apparently, the show is now officially in the music business.